This knife was made by commission. It has a Forged 3'' spearpoint blade with a 'Piemontaise' style action. The steel was taken from a 'Dreadnought' sheffield steel file. The spine has bevelled edges for smoothness and comfort in use. There is a small section of file-work on the internal portion of the blade. 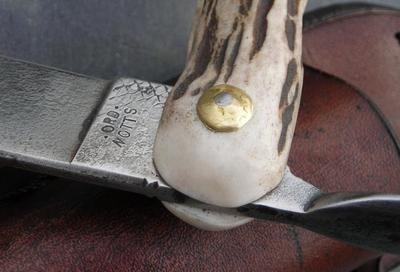 It is handled with Roe-deer Antler with a Leadwood plug to fill the marrow space. The hinge is set in the solid bone 'crown' section of the antler for excellent strength. A rope-stitched leather belt pouch was moulded to the knife for secure carrying. A similar knife can be made to your order for £95 including pouch and the P&P. The knife alone is £75 incl. P&P.